2011 was a really fun year here at The Chubby Vegetarian blog. We created some great recipes, got to appear on the Food Network, and (with a lot of help from Kelly and his staff) pulled off an all-vegetarian brunch for 100 people at Restaurant Iris. All of this and we also signed a contract with Thomas Nelson to publish our first cookbook, which will hit the shelves in March of 2013. We feel very fortunate for all of this, and it's all because of the support of friends like you. So, we'd just like to end this year by saying thank you to everyone who reads the blog, supports what we do, and especially to those of you who inspire us to be creative. We love y'all, and we look forward to a great new year. 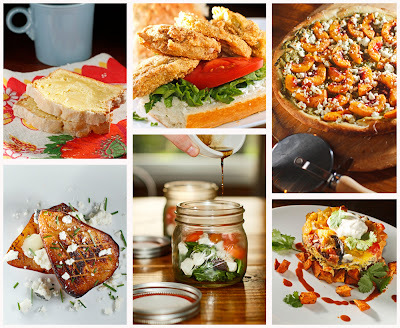 Below is a list of some of our favorite recipes from 2011. Enjoy! Here's to a happy, healthy 2012 as well. Sometimes a cookie idea hits me, and I'll act on it even if I'm not really in the mood for cookies at the moment. 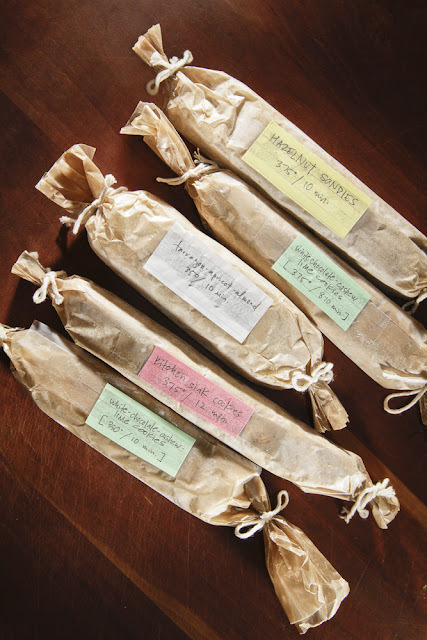 Even when I am, I usually bake 10 or so cookies on one sheet and wrap up the rest in waxed paper and string, label the roll with the basics, and stick it in the freezer for another time. It's good to have a few different options around whenever a craving hits. Recently, a family member was telling me about a big bucket of cookie dough that she bought from some sort of door-to-door saleskid this season. It's been a handy resource for her when she wants to make a few cookies at a time; of course, now I'm thinking she just might need a few mini rolls of our cookies this Christmas. 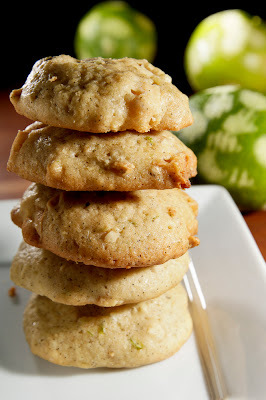 This particular lime zest cookie recipe was one that I had been thinking about for a while as a way to make a margarita-inspired sweet. Adding either cardamom or coriander was considered for these, but neither seemed quite right for what I had in mind; I just threw in the white chocolate chunks I had on hand and also some cashews because they needed some frills. Cream the margarine and sugars. Add lime zest, juice, egg, and vanilla. Whisk the next 5 dry ingredients from flour to vanilla powder. Combine. Add cream by the tablespoon and stir until dough comes together. Add white chocolate and cashews and mix. Chill in fridge for at least an hour. Preheat oven to 375 degrees. Scoop out cookies dough with a spoon or a small ice cream scooper and place one-inch-sized scoops on a Silpat-lined baking sheet. Bake for 10-12 minutes (a little longer for a crunchier cookie). 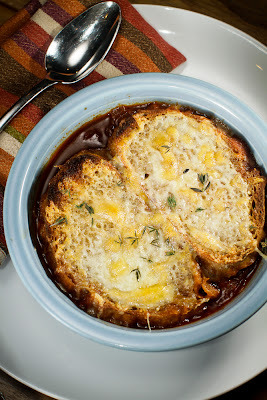 Why let French onion soup have all the fun? So many soups are good served with that same crunchy, gooey crouton up on top. Here, boring old tomato soup gets a serious upgrade. The deep flavor of this soup comes from three tomato sources: the smokiness of roasted Roma tomatoes, the complexity of sun-dried tomatoes, and the sweetness of tomato paste. One of my favorite meals as a kid was grilled cheese and tomato soup. I'd dunk the grilled cheese into the soup, but I'd save the last bit of the sandwich to mop up the bowl. This is like a grown-up grilled cheese and tomato soup with the 'dunk' built right in. This is one dish we'll be making again soon. It was that surprising and good! Turn broiler on high. Slice peeled tomatoes lengthwise and place face-down on a rimmed baking sheet. 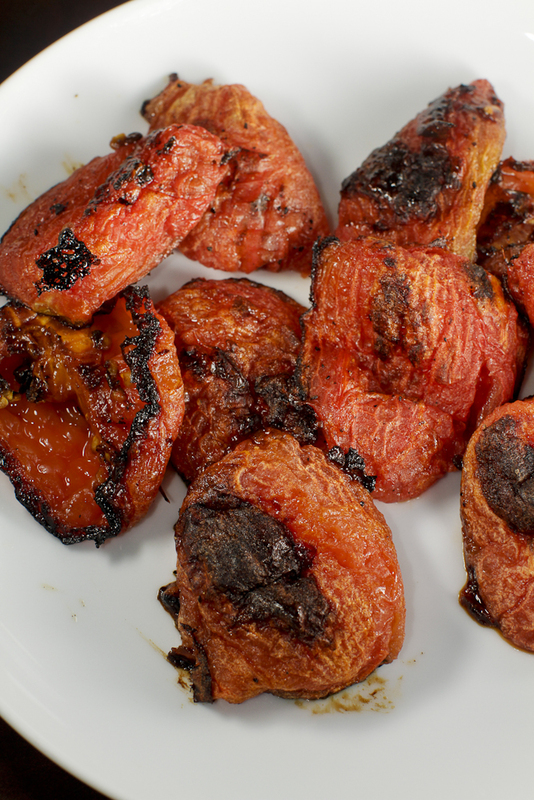 Brush each tomato with the olive oil and place under the broiler until the tomatoes start to blacken. (This should take eight to ten minutes; keep your eye on them.) Once they are done, set the baking sheet aside and allow the tomatoes to cool. In a Dutch oven or heavy pot, heat one tablespoon of butter over medium-low heat. Once butter has melted, add the sliced onion. Allow the onion to sweat down and start to brown. This should take about 15 minutes. Add the brandy and the Worcestershire sauce to the pot and raise the heat to medium. Allow most of the liquid to evaporate, and then add the sun-dried tomatoes, tomato paste, water, broth, and the roasted Roma tomatoes. Bring soup to a boil, then reduce to low. 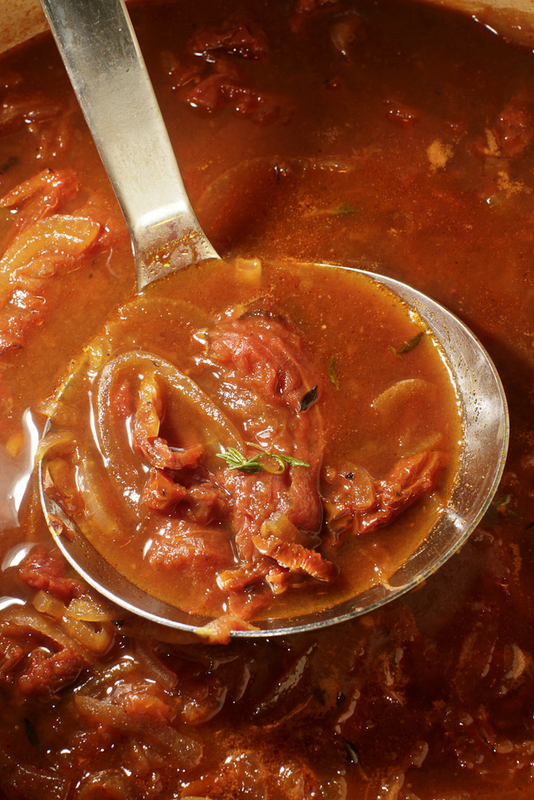 Allow soup to simmer for at least twenty minutes. Add fresh thyme just before serving. To serve, slather toasted bread with melted butter. Turn your oven broiler on medium. Divide soup between two bowls, float slices of bread on top of the soup, and cover toast with the white cheddar. Place bowls under the broiler for two to three minutes or until cheese is bubbling. Serve immediately. 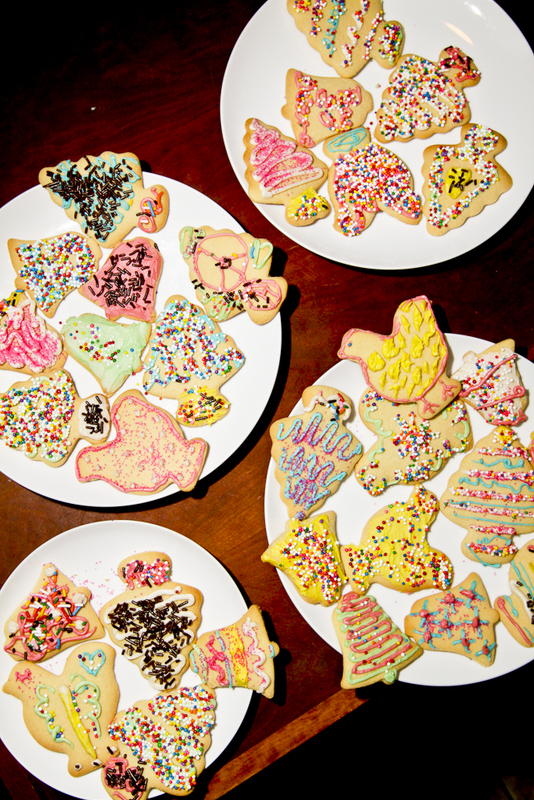 In our family, it just isn't Christmastime until we make and decorate cookies. 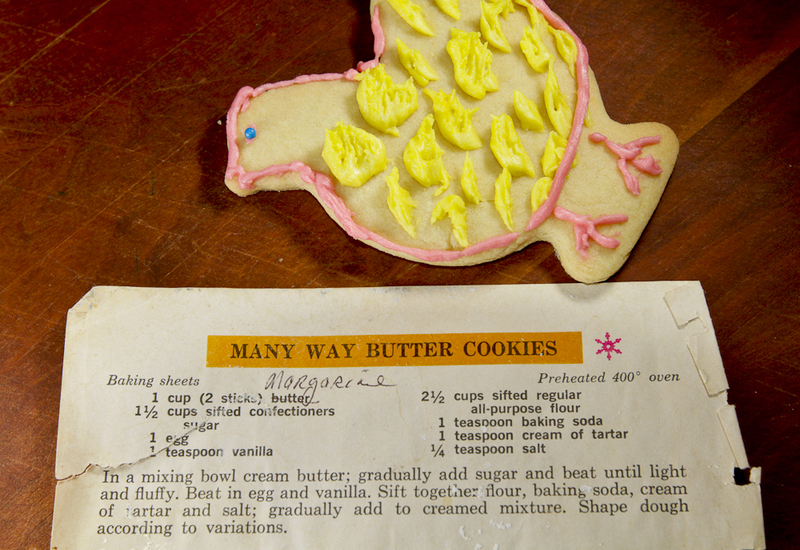 The recipe we've used for years from this 1960's cookbook is called Many Way Butter Cookies. Follow the recipe above and sub in soy margarine if you wish. Next, you just chill the dough in the fridge for an hour. Roll it out onto a floured surface to about 1/4-inch thicknes, and then deploy your cookie cutters. We liked bells, birds, and trees this time around. The (memorized) glossy icing recipe is 1 1/2 cups confectioner's sugar (sifted), 1/2 cup organic shortening, a splash of vanilla, and a few teaspoons or so of half-and-half to get it to come together. We divide that into 5 bowls and add a scant drop of coloring to 4 of them and leave one white. Anyone who has tried one of these cookies calls the next day for the recipe, so we wanted to share it with you. We try to use really good ingredients so that brick-stomach, I-shouldn't-have-eaten-that feeling one gets after consuming some familiar holiday treats doesn't happen; this year, we went a step further and attempted to use healthy sprinkles, which looked like a pack of sad, colorless seeds once we removed them from the package. Sometimes, there's no replacing the classics. This cookie-making-and-decorating tradition has been going on so long now, and I love it. It made for a great afternoon today, actually. Time spent cooking, joking, bickering, eating, and just plain hanging out with the family during the holidays is always the best. We hope you get to enjoy a bunch of it, too, this week as we head toward the big day. You can find spicy olives on the olive bar at almost any specialty store. It's best to get a mix of olives, which will add to the complexity of the dish. Be sure to grab plenty from the spicy bin to give your olive dressing some kick. The bread may be tough to find outside of the South. 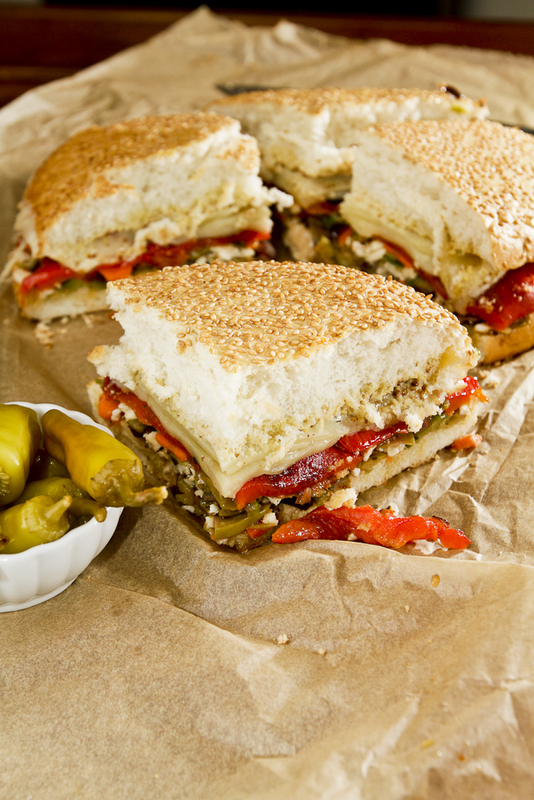 If muffuletta bread is not available from your local deli, use a light focaccia bread instead. The effect will be somewhat the same. I like to use fresh cauliflower and carrots in place of pickled ones. This cuts down on the salt in the dish and makes it more enjoyable, in my opinion. This is a great dish to make for a party. 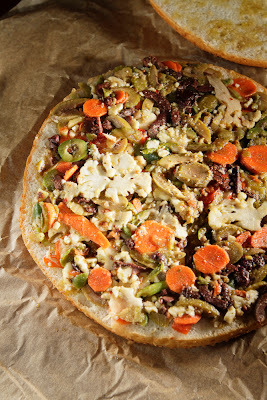 Using the slicer blade on your food processor, slice the olives, celery, cauliflower, and carrots. Place sliced vegetables into a 2-quart container; add the Italian seasoning mix, crushed garlic, olive oil, and vinegar. Allow mixture to marinate and the flavors to meld for a day or so. Seriously, the longer you leave it, the better it will be. Next, preheat your oven to 350 degrees. Slice muffuletta breads in half. On the bottom half of each, spread half of the olive dressing. On the top slices, spread one tablespoon of mayo and two tablespoons of creole mustard and then add half the cheese on each in an even layer. Place dressed bread open faced on a baking sheet in the oven for 15 minutes or until the cheese is melted. 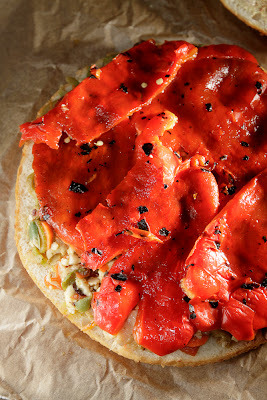 Remove and add roasted red peppers, lettuce, and tomatoes to each sandwich. Place the top on each sandwich. Slice into quarters. Serve immediately. I recently spearheaded a very informal survey in which I asked my readers if they liked tofu or not. Overwhelmingly, the answer was that it really depended on how it is prepared. I can assure you that this recipe would pass the test. I mean, the tofu is accompanied by sweet, toasted almonds and a buttery white wine sauce. 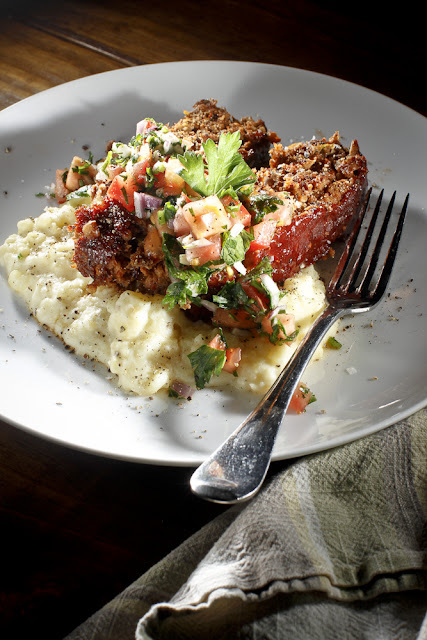 What could be better than this vegetarian take on a New Orleans classic? The sauce is the key to the deliciousness of this dish. I try to be calorically frugal, so I used it sparingly. However, the pan with the sauce in it found its way to the dinner table where it was further drizzled with abandon. Vegans, try this recipe with Earth Balance and coconut milk. I'd love to hear how it turns out. Cut the tofu into six 'filets' that are thicker on one side than the other, i.e., they come to a point in a way. Season both sides of the tofu with sea salt, black paper, red pepper flakes, and paprika. Place 1/4 cup of flour on a large dinner plate. Dredge each filet on both sides and shake off any excess flour. Heat a 12-inch skillet to medium heat and add the canola and butter. Once the butter has melted, gently lay seasoned, dreaded tofu filet into the pan; this is best done in batches of three. Cook tofu for 4-5 minutes on the first side of until golden brown. Flip each piece and repeat the same cooking process for the other side. Removed cooked tofu filet to a cookie sheet and keep warm in a 300 degree oven until ready to serve. 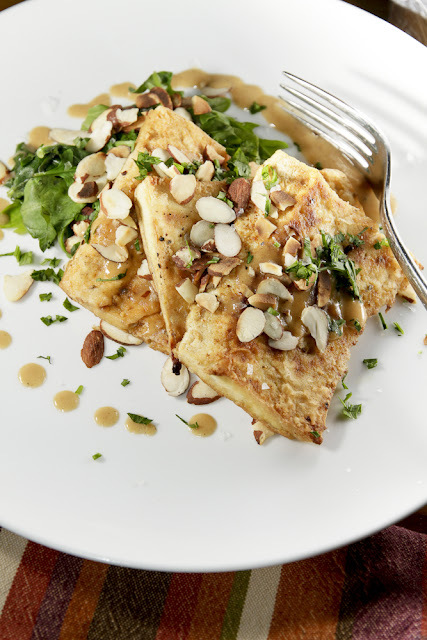 To serve, place one tofu filet on a bed of wilted greens or potato hash, drizzle a teaspoon of sauce over it, and then add a few toasted almonds. Repeat by stacking the filets three high. To finish, drizzle the sauce around the plate and garnish with a little chopped parsley. In a medium-sized saucepan over medium heat, melt one tablespoon of butter and sauté the shallot in butter until shallot appears translucent -- this should take about two minutes. Cut lemon in half and add the juice from the lemon and also the rind to the pan. (Don't worry about seeds; you will strain this sauce later.) Add the worcestershire sauce, sugar, bay leaves, pepper and wine to the pan. Allow mixture to reduce by half or until it begins to look syrupy. Add the half and half to the mixture, and then strain the whole thing through a fine-mesh strainer. Rinse the pan of any debris and then return the strained sauce to the pan. Keep warm until ready to serve. Just before serving, whisk in the remaining tablespoon of butter. 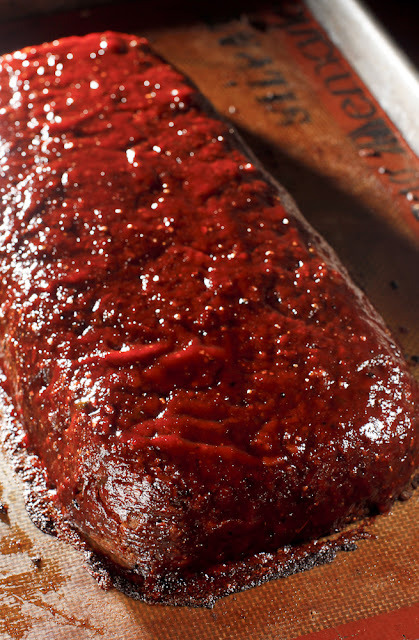 This process is known as mounting a sauce with butter, and it results in a very rich and flavorful sauce. 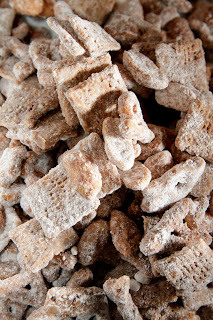 Using the best ingredients in what I've decided to call White Gold this holiday season is ridiculously and senselessly fancy, and that's what makes this holiday snack mix taste better than any other version I've sampled before now. I figure the classics are classics for a reason, but elevate them, and they're even more impressive. This isn't something to make in big batches and give away with abandon, so make a small batch and share it with a few deserving people who will understand the wink to tradition. Mix cereal, pretzels, and peanuts into a big bowl. Melt peanut butter, soy margarine, and chocolate in the microwave at 30 seconds at a time stirring in-between so that the chocolate doesn't scorch. Pour it over the dry mix and stir until it's all coated completely. 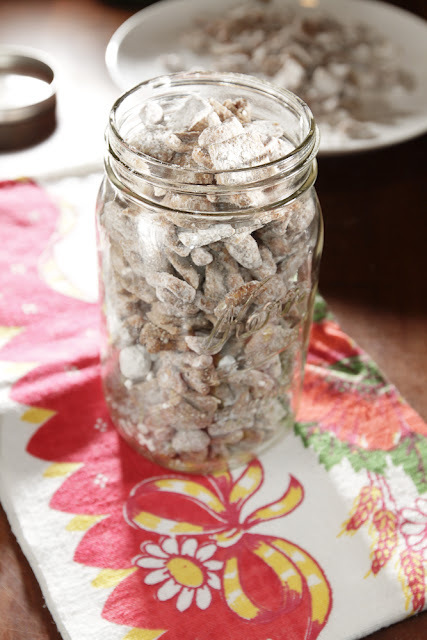 Sift powdered sugar into a large container and then pour in the chocolate-peanut butter mix. Shake until it's all coated white. Lay out your precious White Gold in a thin layer on two plates to cool and set. Serve it in small cups at a party or hide it away in a jar. Like the Oyster Mushroom Rockefeller, I thought it would be fun to continue the play on words. 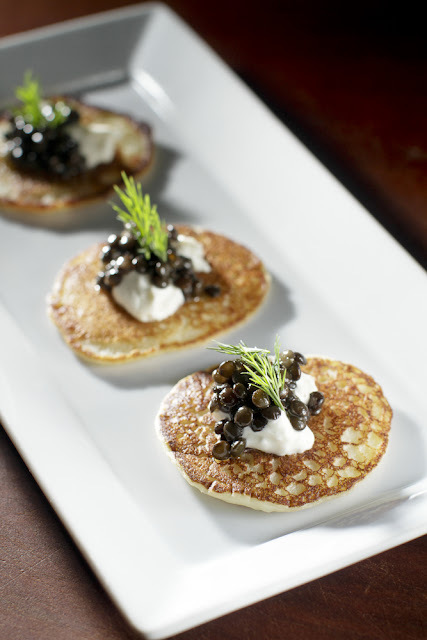 Here beluga lentils stand in for beluga caviar in this classic Russian dish. My blini are tender and light, so they make a great canvas for the other flavors. 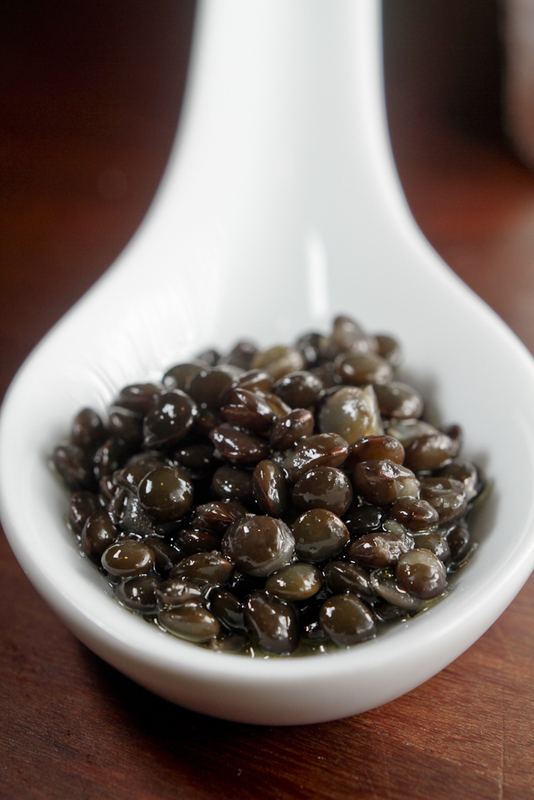 The beluga lentils are flavored with kombu, which is dried seaweed. It seems like a strange ingredient, but it's available at Whole Foods. It tastes like the sea. That along with the sea salt is fairly convincing. This is a great dish for your holiday party -- or just serve it along with a salad for a light meal. To assemble the dish, top each blini with about a teaspoon of créme fraiche followed by the same amount of beluga lentils. Garnish each with fresh dill and black pepper. Cover the mixture and set aside for thirty minutes to allow it to rise. Adjust the thickness as needed using up to 1/4 cup of water. You want it to be as thick as, well, pancake batter. Place potato, water, and butter in a covered, microwave-safe dish and microwave on high for six minutes. In the meantime, mix flour, yeast, salt, and sugar in a large mixing bowl. Also in a small mixing bowl, mix the egg and buttermilk. Run the potato through a ricer and into the large mixing bowl with the flour. Now, using a whisk, mix the wet ingredients with the dry. In a 12-inch skillet over medium heat, heat one tablespoon of oil. Once the oil starts to shimmer, add batter a tablespoon at a time to form small pancakes. (You will fit about five pancakes in the pan at a time.) Allow blini to cook for 2 minutes per side. Cook in batches, adding a tablespoon of oil to the pan if it looks dry. Add water, kombu, lentils, and salt to a saucepan. Bring it up to a boil, and then allow it to simmer, covered, for 20-25 minutes or until tender. Allow the lentils to cool in the liquid. Remove kombu and discard. Drain lentils and then add the olive oil. Serve at room temperature.